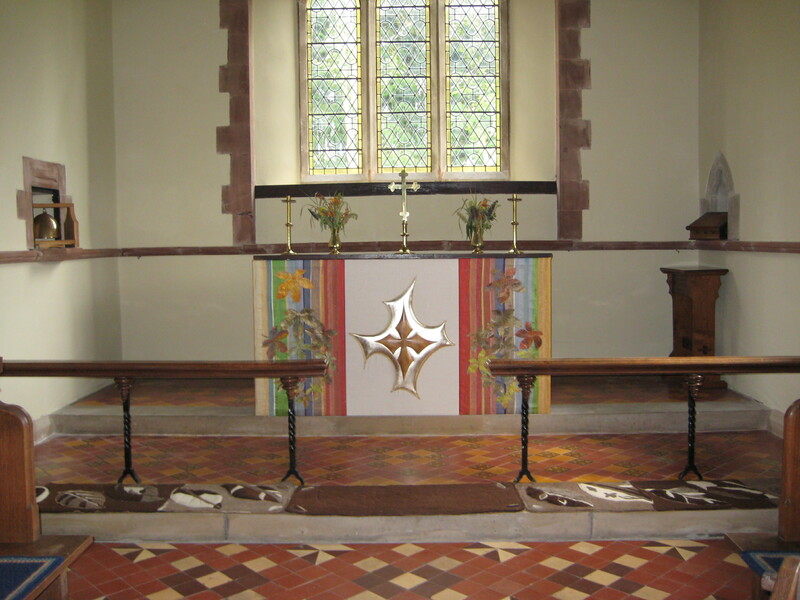 St. Michael & All Angels at Lingen sits on a site of an earlier church which dated from the 13th century. 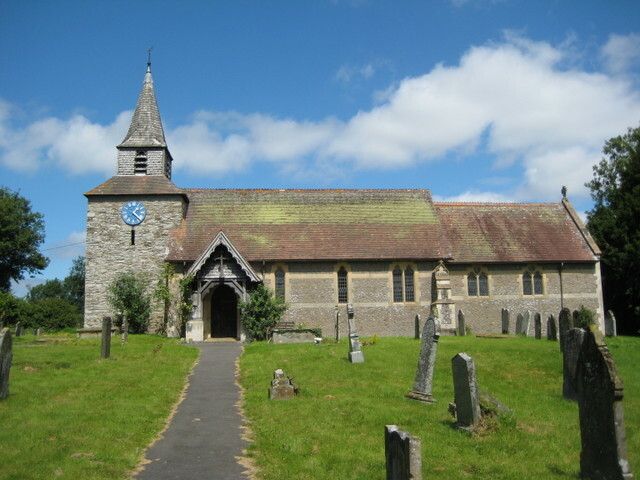 Unfortunately the earlier church became so dilapidated that it had to be completely replaced. Sacred to the memory of Bridget, wife of Philip Bryan Davies. She died July 26th 1810 aged 36 years. 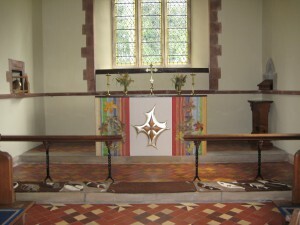 A loving wife, a mother dear, a faithful friend lies sleeping here. 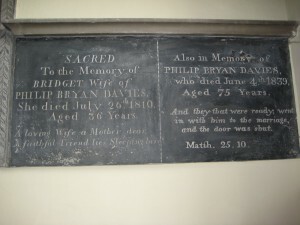 Also in memory of Philip Bryan Davies who died June 4th 1839 aged 75 years. 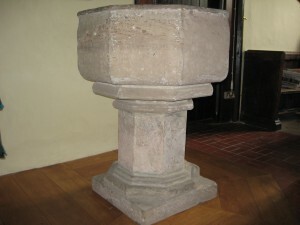 \”And they that were ready went in with him to the marriage, and the door was shut\”. 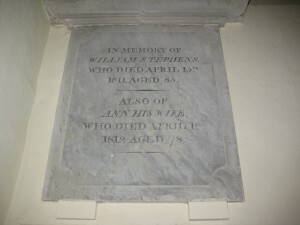 In memory of William Stephens who died April 15th 1811 aged 85. Also of Ann his wife who died April 1st 1812 aged 78. 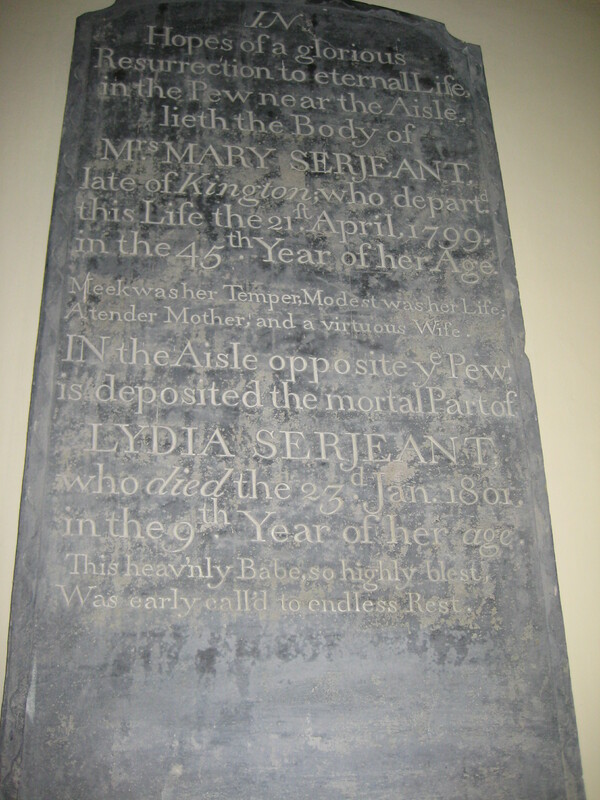 In hopes of a glorious resurrection to eternal life, in the pew near the aisle lieth the body of Mrs. Mary Serjeant late of Kington, who departed this life the 21st April 1799 in the 45th year of her age. Meek was her temper, modest was her life, a tender mother and a virtuous wife. In the aisle opposite ye pew is deposited the mortal part of Lydia Sergeant who died the 23rd January 1801 in the 9th year of her age. This heav\’nly babe, so highly blest, was early called to endless rest.